She must be brave to create a dark plot about arranged marriages in strict, conservative Arab families that isolates Palestinian women with emotional and physical abuse, risking perpetuating negative stereotypes about Rum’s own immigrant community at a time when hate crimes and anti-immigrant sentiments are sharply on the rise in America and globally. “Surely I’ll only upset people and fuel further discrimination already stereotyped by a single story. It would be the ultimate shame,” Rum says. Yet she dares doing so anyway. 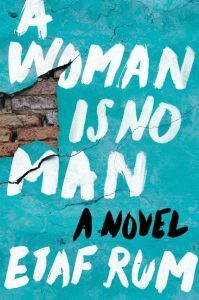 Her compelling novel is set in Brooklyn, where Rum was born and lives, perhaps in the same Bay Ridge multicultural community her characters dwell. Bay Ridge is depicted as close-knit. “It was as if all the Arabs in Brooklyn stood hand in hand, from Bay Ridge all the way up to Atlantic Avenue, and shared everything, from one ear to the next. There were no secrets between them.” So why reveal secrets, whether there’s any truth to them or well-fictionalized we perceive these truths to be real? Rum’s confidences about her fears lead us to believe she is exposing truths meant to stay behind closed doors. Why raise the stakes of dishonoring her culture, in which honor and “reputation is everything”? Will the novel be seen as an act of betrayal? Or, a contemporary woman’s activism to be the voice for the “voicelessness [that] is the condition of my gender”? Will the reader be inspired by defiant characters, or pained by the obedient ones? Book clubs have plenty to talk about as the novel raises contentious cultural issues in a multilayered, generational approach. Four Palestinian women – the two oldest are immigrants, the two younger born in America – show how past cultural traditions keep repeating (the older generations) while their children resist and defy the limits placed on them simply because they’re female. Whose voice will the reader hear? The older ones who believe “obedience is the only path to love”? The younger ones struggling to find “the courage to stand up for yourself, even if you’re standing alone”? The older women immigrated to Brooklyn from two cities in the West Bank of Palestine, disputed territory in the Israeli-Palestine Peace process. 1. Fareeda: came to the US from a Palestinian refugee camp. Survived poverty, married off in her teens, mother of three sons and a daughter (see Sarah below.) Her influence intensifies as the plot does. She clings to a narrow view of women restricted to the home, that a daughter’s sole purpose is to cook, clean, serve, and become a mother who will give birth to boys; girls are a disgrace, a burden, a curse – the jinn. Men bear burdens too, financially obligated to support their family. Adam, her eldest, bears the brunt, reflecting immigrants “working like dogs,” which plays out destructively when he goes to Palestine and brings home eighteen-year-old Isra through another arranged-for-marriage. It’s their marriage, their sad, abusive story, that overpowers the others. 2. Isra: unhappy when we meet her at 17. Forced to leave her homeland, her parents, and her pastoral home overlooking fig and olive trees. Raised by a traditional mother who subscribed to the same beliefs about women as Fareeda; a mother who expressed no love or warmth, also like Fareeda. Isra grabs our hearts, so quiet and submissive all she can do is hope that in the land of the free she’ll find love and freedom. Not so when she keeps giving birth to daughters – four in all. She’s the victim of Adam’s anger, angst, exhaustion. Sometimes he unexpectedly hits her over the slightest thing; other times Isra knows when he’s coming for her. 3. Sarah: Fareeda’s only daughter. Supposedly married off but no one has heard from her. She befriended Isra when she and Adam came to live under Fareeda’s dark roof, in a depressing basement. 4. Deya: Isra’s oldest daughter, the youngest of the four. It’s her melancholy/distraught/confused/questioning narrator’s voice we hear. Yet it’s Isra’s voice from the past that haunts the novel, haunting Deya too. She misses her mother who died when she was eight. That’s ten years ago by the time she tells us these tangled stories. Told her parents died in a car accident, Deya yearns to know more about Isra so she can remember her beyond recalling how unhappy she seemed. If only Fareeda would tell her something perhaps she wouldn’t feel so abandoned and unloved. Fareeda’s silence turns the novel into a mystery as we become suspicious of what really happened to Isra. Rum’s prose has a gentle rhythm to it. But Isra’s tale, and the sequestered world of these women, isn’t gentle at all. One wonderful exception: books are life-savers for these women (except Fareeda). Books are literally the only source of their happiness, dreams, and sense of love. Through literature they “dreamed of bigger things – of not being forced to confirm to conventions, of adventure, and most of all love.” But reading is a major feat, acquiring books and then having to hide them. Deya is confused though. She’s taught in her Islamic studies class women are meant to be respected. But she (and her female classmates) can’t understand her teacher when he asserts “heaven lies under a mother’s feet.” They can’t even answer his question: What is the role of women in their society today? It seems fair to say belongingness is complicated to navigate for most immigrants. For these women (except Fareeda), it’s made tougher because they feel unwanted in their own home. Inclusion, self-determination, and freedom are not just messages for Palestinian-American women, but for women everywhere struggling to be heard.